Make yourself at home. Photo courtesy of Baccarat. 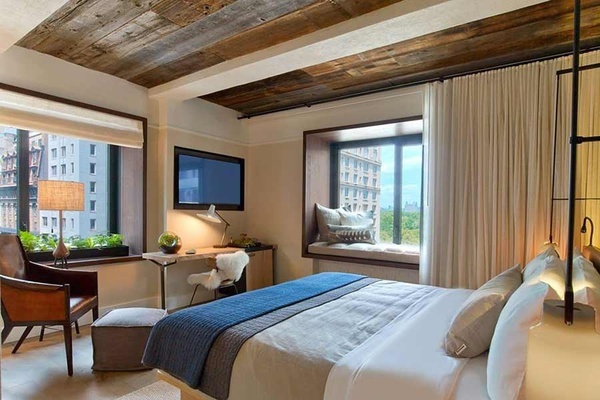 Gentedimontagna reports on the ever-growing hotel scene in New York City. Herewith, a few highlights. It's that time again. When we fantasize about being tourists in our own city (New York, New York) and check out the hotels we'd like to check into. Last year ushered in a bounty of boutique hotels — small, charming, neighborhood spots that reflect the boho/moneyed/vintage sensibilities of their surroundings. This year, we've noticed well-known brands staking a claim in the boutique bourgeois market and opening their flagships on Manhattan soil. It's also worth noting an exciting development ... in Queens. Surely it's a sign of newer, bolder times. The Grand Salon. 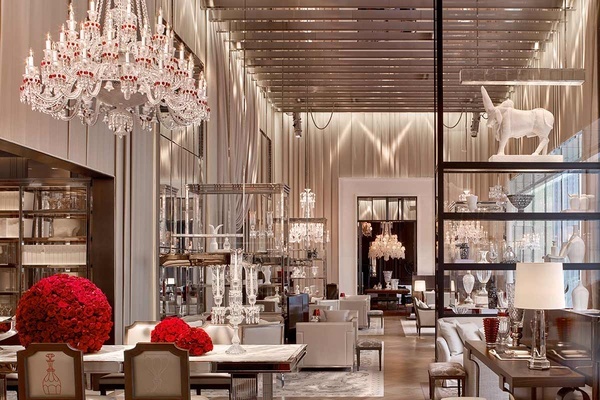 Photo courtesy of Baccarat. 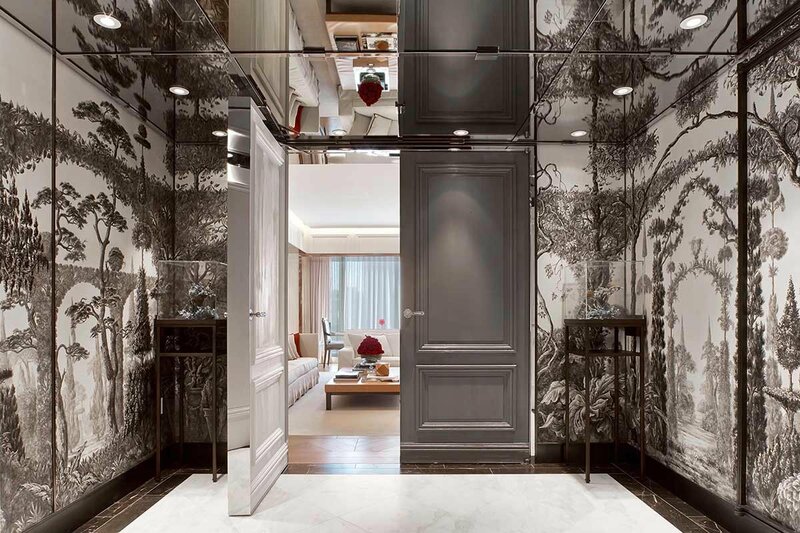 Specs: The 250-year-old French crystal maker spared no expense designing this luxurious riff on a Parisian hôtel particulier. Nearly everything is custom-designed, from the crystal-laden exterior to the sparkling ceilings, lavishly silver-leafed paneling, silk-covered walls, and namesake glassware glimmering throughout the hotel. Pluses: Tons of photo-ready spaces for lounging around, including the elegant Grand Salon and the bistro-inspired Les Boissons Bar (where cocktails are poured into Baccarat glasses). The pool is lovely. As is the in-room mini bar. And the spa collaboration with prestigious European beauty brand La Mer. If you decide to ever leave, MoMA is right across the street. Minuses: Minimalists need not apply. Unique Selling Point: Wildly expensive and over-the-top, you will absolutely be transported to another time and place. Corner room with Manhattan views. Photo courtesy of Boro Hotel. Specs: In the emerging neigborhood of Dutch Kills, a kind of bizarre crossroads between Astoria and Long Island City, a rather unremarkable building conceals a beautiful industrial hotel interior. Designers Grzywinski+Pons outfitted 108 rooms with floor-to-ceiling windows, concrete walls, white oak floors, volcanic limestone baths from Victoria + Albert, and Frette linens. 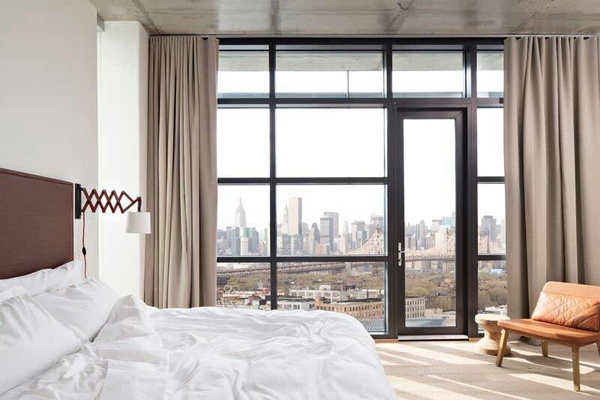 Pluses: Panoramic views of Manhattan and Queens and easy access to the Upper East Side and Midtown Manhattan. Minuses: A 25-minute walk to Long Island City's main dining strip — nothing a short Uber ride can't fix. The restaurant and cocktail bar aren't slated to open until late fall. Unique Selling Point: When it comes to lodging, it's the coolest offering in the borough. It's also a family business, a nice touch in a big city. Sleek and contemporary. Photo courtesy of NY Edition. 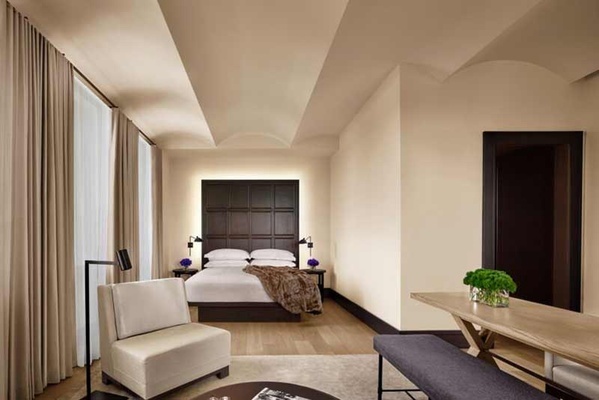 Specs: The iconic Clocktower building of 1909 is the new flagship of Edition, the hotel concept from Ian Schrager and Marriott International. The space is airy, sophisticated, and pristine — with silk drapes, Venetian plaster, and a stunning torqued staircase that is a work of art. Pluses: The lobby bar, a pop of yellow, has a buzzy professionals-at-leisure scene; the Rose Room, Blue Room, and Pool Room on the second floor feel like hidden vestiges of early 20th-century clubhouse culture. Minuses: There's an absence of historic architectural details in the rooms, which hover around the $700 price point (and well beyond). Unique Selling Point: It's spitting distance from the original Shake Shack (a landmark in its own right). The cityscape views are excellent. Ahhh. The spa. 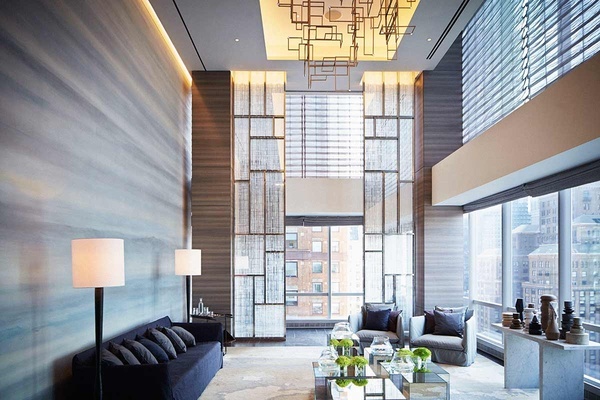 Photo courtesy of Park Hyatt New York. Specs: As the global flagship, the Christian de Portzamparc-built, Yabu Pushelberg-designed hotel is dressed to impress. Rooms (210 of them) are spacious, elegant, and minimalist. Sophistication is the name of the game. Pluses: Floor-to-ceiling windows, h decor, lots of places to lounge and plenty of space to breathe. Minuses: The food is okay but won't blow your mind. (It might, however, blow your wallet.) It's more about the sophisticated surroundings. Unique Selling Point: A beautiful indoor swimming pool (a hot commodity in NYC) and a gorgeous spa (with the biggest suites in the city). Rooftop bar A60. Photo: Adrian Gaut / Sixty SOHO. Specs: A multi-million dollar reno has resulted in an all-new look for the 97-room boutique property. The vibe is modern and sophisticated and also a bit more lush than we remember from its former incarnation, 60 Thompson. 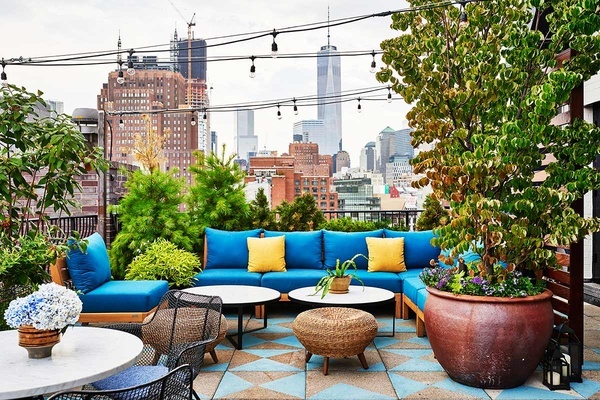 Local restaurateur John McDonald opened the buzzy Italian restaurant Sessanta and reimagined the rooftop bar as a landscaped high-rise garden. Pluses: You can't beat the prime Soho location. Rooms feel residential, well-tailored, and cozy. Bath products by Ren, robes by Sferra, indoor and outdoor bar options, and a handsome lobby. Minuses: Room sizes are in keeping with the neighborhood (small and cozy). The scene can be highly fashiony at The Gordon Bar and on the roof — exhausting if you just want to unwind after work with a drink and no judgement. Unique Selling Point: Ten suites have French balconies overlooking the (thankfully) still charming Soho skyline. Nesting. Photo courtesy of 1 Hotel Central Park. Specs: The brand ethos is social responsibility in hospitality (a tall order in the country's busiest metropolis). But they deliver in details you can see (lots of organic materials and plants, reclaimed barn wood, eco hair dryers) and cannot (high-grade water filters, hemp mattresses, ecofriendly dry cleaning). Pluses: Rooms and suites feel more like nests perched high above Central Park, which is right across the street. Kids and pets are welcome to stay, too. There's also a lobby farmstand and goodie bags upon arrival filled with healthy snacks. Early reports confirm very friendly, on-point service. Minuses: If you don't request a room with a view, the only green you'll have to look at are the hanging ferns in your room. Unique Selling Point: You can have it all: a do-gooder lifestyle, luxurious surroundings, a respite from the urban hum, aromatherapy (a la a signature fresh, outdoorsy scent) and Central Park as your backyard.